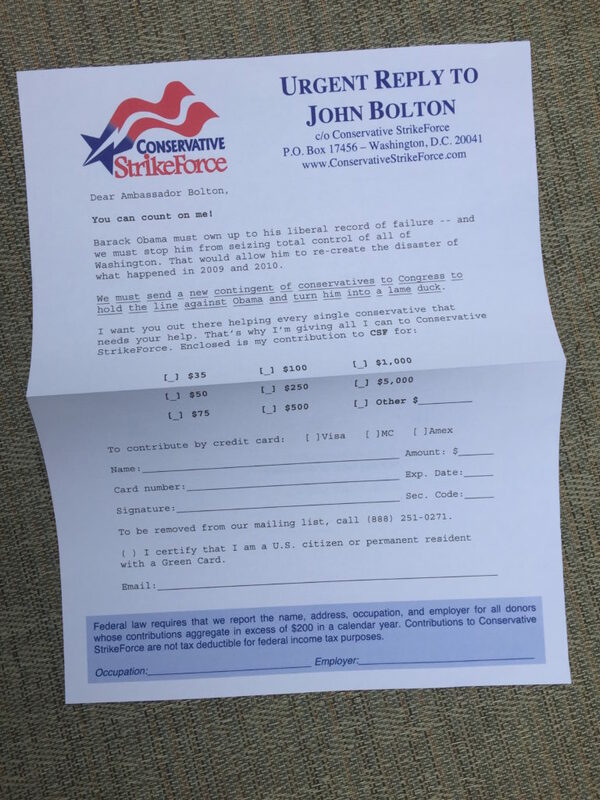 Right after President Trump named John Bolton as his new National Security Adviser, I spent a few minutes flipping through my giant pile of political junk mail looking for Bolton, and I found him. 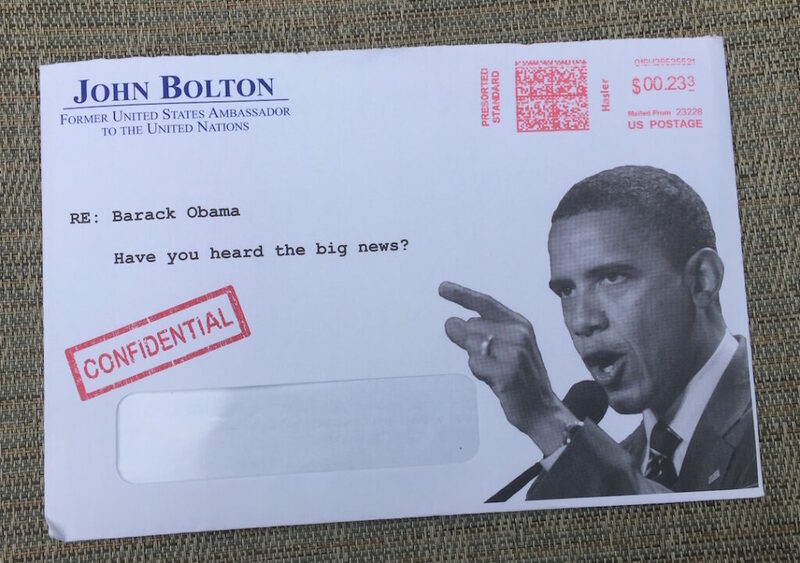 As junk mail goes, Bolton’s piece is nothing special. Dated 2014, it’s a standard 4-page letter with a 1-page reply form, carried by a 6×9 window envelope imprinted with an obligatory photo of Barack Obama looking angry, which to some people is scary. 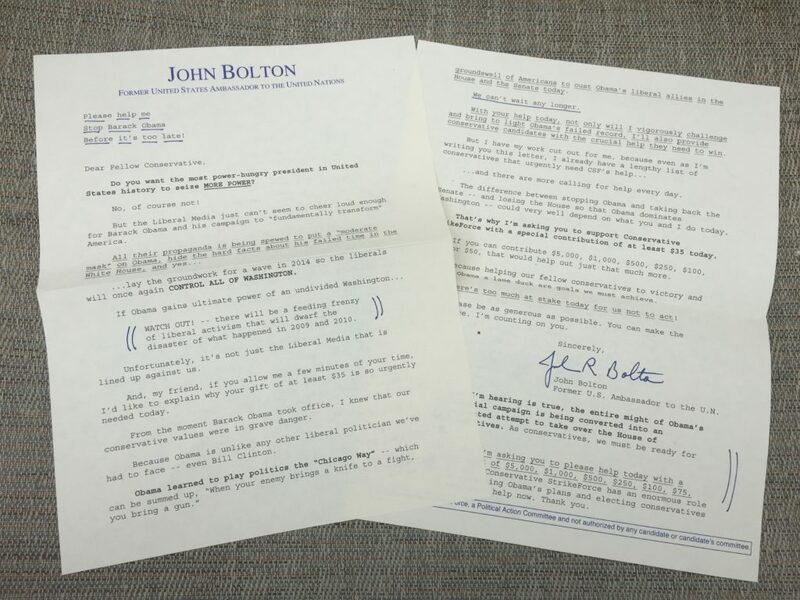 The letter quickly gets to The Ask, just below the fold of Page 1: “And, my friend, if you allow me a few minutes of your time, I’d like to explain why your gift of at least $35 is so urgently needed today,” wrote the copywriter pretending to be Bolton. Unlike the “Bolton way,” which is to bring a nuclear bomb. The ultimate recipient of my solicited donation is not identified until the bottom of Page 2: “My friend, I’m dedicating my energies to the one group that will expose the dark side of Obama and his liberal allies for all to see – Conservative StrikeForce. Believe me, this is no ordinary group. And with your help today, it’s about to make some serious noise fighting Obama’s Socialist agenda.” What exactly the “serious noise” will consist of is not mentioned, and for good reason. That’s because Conservative StrikeForce is a “Scam PAC” – a Political Action Committee that exists primarily to line its own pockets with donations sent in by names on a list. Those devoted conservatives are Dennis Whitfield and Scott Mackenzie. Whitfield was the Chairman. “Prior to joining Conservative StrikeForce, Mr. Whitfield served as the executive vice-president of the American Conservative Union from 2008-2011,” says the site. 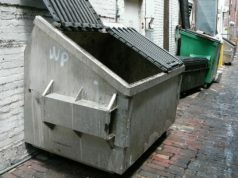 “Before ACU, he served as the senior vice president for the National Federation of Independent Business from 1998-2002. Prior to NFIB, Mr. Whitfield was the former deputy secretary of labor under President Ronald Reagan from 1985-1989.” According to Bloomberg, he was also a director of BKSH and Associates, a lobbying firm that included Paul Manafort and Roger Stone. Mackenzie was the treasurer, and is not to be confused with the singer of the same name, who wrote the 1967 hippie anthem about going to San Francisco with flowers in your hair. “All monies are processed and handled by outside, independent processing firms under the direction of Mr. Mackenzie,” according to the site. 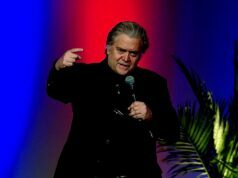 To handle its fundraising needs, Conservative StrikeForce hired Strategic Campaign Group, Inc., a consultancy whose senior advisor is … Dennis Whitfield. And that’s how Scam PACs work. The suit was settled in 2015 and Conservative StrikeForce was required to pay Cuccinelli $85,000. Another Whitfield/Mackenzie scam PAC, Patriots For Trump, shut down in 2015 after the Trump campaign sent a letter demanding that it stop raising donations without its authorization. Patriots for Trump raised $131,622, all of which was spent on consulting firms, according to the HuffPost. One of those firms was Campaign Communications LLC, which operated out of the offices of Strategic Campaign Group. 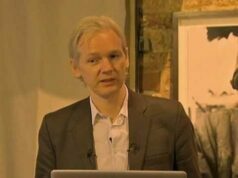 In May 2017, the FBI carried out a widely-reported raid on Strategic Campaign Group’s headquarters, but the purpose of the raid was apparently never revealed, and the group is still in business. So if you’re thinking of starting a Scam PAC, click on StrategicCampaignGroup.com without further delay! 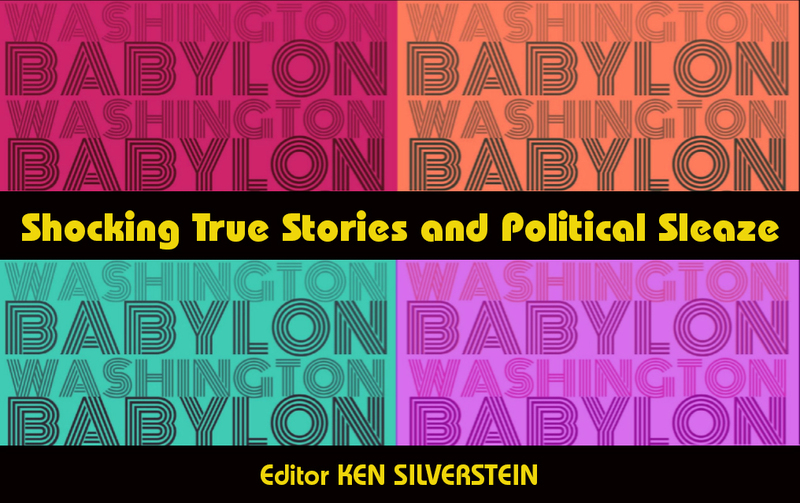 David Bonner is a Washington Babylon contributing writer and senior analyst of pulp affairs. Direct response copywriter and author of the newly published coffee table book “Selling Folk Music” (University Press of Mississippi).